Leschi Market is a family-owned neighborhood institution—we've been here since the mid-40s. We are a full service grocery store and can meet your needs from soup to truffle salt. We have an on-site butcher stocking our meat case with beef, lamb, chicken, fish, many prepared specialties and a large variety of our famous home-made sausages. We carry a variety of organic and natural meats. Our meat cutters are always on hand to help with that special request. Our well-stocked deli department has domestic and imported cheeses, deli meats, our own smoked bacon, smoked ham, and many salads. Our produce department has been recently expanded to offer a full range of organic and regular items. Our wine department carries over 1600 labels, and our wine staff are always on site to assist with selections or special orders. We believe our pricing is the best in the city. 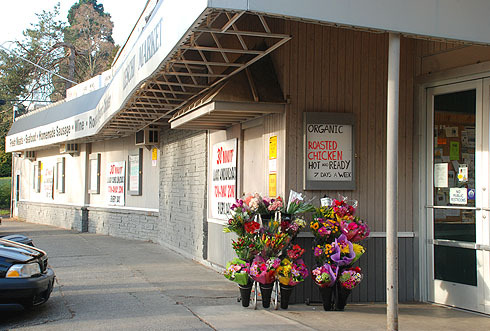 Leschi Market is proud to be your grocery store and a part of the Leschi community. ©2010 Leschi Market. All rights reserved.